Another BJP leader, Maneka Gandhi, has threatened not to help Muslims who don’t vote for her. 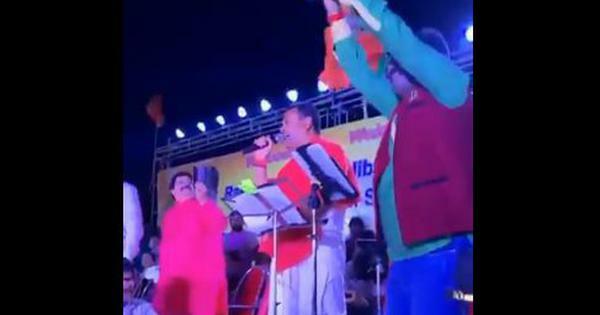 In a video that has gained considerable attention on social media, Sakshi Maharaj, the Bharatiya Janata Party candidate for the Lok Sabha elections 2019 from Uttar Pradesh’s Unnao constituency, can be heard threatening to curse people if they do not vote for his party. According to Sakshi Maharaj, if an ascetic comes begging for alms and is not given anything, he “takes away the happiness of the household and leaves the pain of his own wrongdoings behind”. Sakshi Maharaj, who identifies himself as an ascetic, compared votes to alms for himself. “I am not here to ask for your wealth or other materialistic things, I am here to ask for votes that will improve the fortunes of the entire population of India,” he added. He compared matdaan (Hindi for voting) to kanyadaan (a ritual observed during Hindu weddings where parents of the bride officially “give away” their daughter to the groom), saying that people think multiple times before doing kanyadaan, and that matdaan is equivalent to lakhs of kanyadaan. Earlier in the day, another BJP leader Maneka Gandhi was heard threatening Muslim voters in Sultanpur, Uttar Pradesh, during her election campaign. “I am winning, but if my victory is without Muslims, I will not feel good, because then there is a bitter feeling,” she said. Maneka Gandhi added that if Muslims come to her for work after she wins the elections, she may not help them because “employment is a negotiation after all”.